The Melbourne Storm are a rugby league team based in Melbourne, Victoria in Australia, that participate in the National Rugby League. The first fully professional rugby league team based in the state, the Storm entered the competition in 1998. The Storm were originally a Super League initiative, created in 1997 during the Super League war, however, following the Super League collapse, the team became a part of the newly formed, united competition. The club play their home games at AAMI Park. The Storm have won three premierships since their inception, in 1999, 2012 and 2017, have contested several more grand finals and were stripped of the 2007 and 2009 premierships, following salary cap breaches. The Storm also competed in the NRL's Under-20s competition (as Melbourne Thunderbolts) from 2008 until its demise in 2017 and now in 2018 have entered the (Victorian Thunderbolts) in the Hastings Deering Colts u20s QLD competition. In addition, the club has also expanded into netball with a joint venture with University of the Sunshine Coast. The Sunshine Coast Lightning commenced playing in the National Netball League in 2017. Following record attendances at State of Origin fixtures in Melbourne of 87,161 in 1994 at the Melbourne Cricket Ground, the Australian Rugby League (ARL) had planned to establish a Melbourne-based team in the Premiership by 1998. However, the disruption caused by the Super League war caused great change to the game in Australia. By May 1997, Super League boss John Ribot pushed for a Melbourne-based club for his competition, which was the rival of the ARL. Former Brisbane Broncos centre Chris Johns became the CEO of the club and Ribot stepped down from the head of Super League to set up the club. In September 1997, Melbourne announced that Chris Anderson would be their foundation coach, and then Super League announced that the new team would be named the Melbourne Storm. In 1997, there were 21 rugby league teams running around Australia (and one in New Zealand), but none in the country's second-largest city. In 1998, with the game reunited, three clubs had been jettisoned and the Melbourne Storm had bobbed up as an unexpected and initially curious addition to the landscape. The Melbourne club then went forward with signing players, mainly from folding Super League clubs Perth Reds and Hunter Mariners. These players included Robbie Ross, Glenn Lazarus, Brett Kimmorley and Scott Hill. With the Super League and ARL joining into one competition for the 1998 season, the Melbourne team became part of the National Rugby League (NRL). The Melbourne Storm Rugby League Club was unveiled at a function at the Hyatt Hotel – Melbourne in February 1998. In their first game, they defeated the Illawarra Steelers, with Glenn Lazarus as their inaugural captain. Melbourne, in a complete shock to the rest of the competition, won their first four games, before losing to the Auckland Warriors. They went on to make the finals, but were defeated by the eventual premiers, the Brisbane Broncos. In January 1999, CEO John Ribot negotiated a deal that saw Melbourne Storm games televised in China every weekend. The club won eight of their first eleven games of the 1999 NRL season, and went on to make the finals in third position on the Premiership ladder. The team was beaten convincingly 34–10 in the quarter final by St. George Illawarra. After narrow victories against the Canterbury Bulldogs and the Parramatta Eels; however, Melbourne once more faced St. George Illawarra, this time winning 20–18 and securing their first Premiership. Melbourne's Premiership defence began relatively slowly losing their first four games of the 2000 NRL season, the club went on to make the finals (finishing 6th), but were eventually knocked out by Newcastle Knights in the quarter-finals. Between 2001 and 2002, the club's on field performances waned, resulting in a 10th-placed finish in 2002. Cracks were starting to appear between John Ribot and Anderson throughout the period, with Anderson quitting as coach after round 7, 2001. He was replaced by Mark Murray. The Melbourne club failed to make the finals in 2001. Johns left the club as CEO at the end of 2002 and coach Murray was sacked due to Melbourne's poor form, with the club missing the finals for the second year in a row. Wayne Bennett's assistant coach at the Brisbane Broncos, Craig Bellamy was announced as the new coach of Melbourne for 2003. In addition to a new captain in Kiwi international skipper Stephen Kearney, Bellamy's strict coaching would see the Melbourne Storm get back on track from the previous lean years. Now, the Melbourne Storm are here to stay. They are not moving and News Limited is apparently committed to keeping them financially. I am OK with that. I hated Melbourne when they were in place of traditional teams that were expelled, but that's all over now. If they want to persevere in Melbourne, I have no argument. Between 2003 and 2005, Melbourne consistently made the finals, but lost games in the semi-finals that prevented them from reaching the grand final. On 17 July 2004, during round 19 of the 2004 NRL season, Danny Williams king-hit Wests Tigers' player Mark O'Neill. Williams defended the incident, using four medical experts to argue on his behalf that he was suffering post-traumatic amnesia when the incident occurred, which he claims was the result of a high tackle by O'Neill just prior to the incident. Despite Williams' claim, he was suspended for 18 weeks by the NRL judiciary. After the decision, Williams stated that he was "obviously disappointed with the outcome". It was the longest suspension in Australian rugby league since Steve Linnane was suspended for twenty weeks for eye-gouging in 1987. In 2005, Storm coach Craig Bellamy, in his third season as an NRL coach, gained representative honours when he was selected to start coaching the Country Origin team. Season 2006 saw the retirement of captain Robbie Kearns, the emergence of talented rookie halfback Cooper Cronk, taking the reins from Matt Orford, and the recruitment of hard-man Michael Crocker. Contrary to expectation, 2006 was a standout year for the Melbourne team, winning their first Minor Premiership. Melbourne only lost four games in the season, making them outright leaders by four wins. They went on to win their two finals matches, and were favourites in the 2006 NRL Grand Final, but lost 15–8 to the Brisbane Broncos, in a match where controversial refereeing decisions against Melbourne caused much media coverage. In 2007, the Storm finished the season Minor Premiers by finishing on top of the table again. They progressed through the finals series with wins over Brisbane, 40–0, and then Parramatta 26–10, in the Preliminary final. This secured a berth in the 2007 NRL Grand Final against the Manly Sea Eagles which they won 34–8, with Greg Inglis winning the Clive Churchill Medal for best on ground. In 2008, foundation player Matt Geyer became the first player to play 250 games for the club. Melbourne finished on top of the ladder after the 26 rounds of regular competition and despite becoming the first minor premiers since the McIntyre Final Eight System was introduced to lose their opening finals game (15–18 to the New Zealand Warriors), they then defeated the Brisbane Broncos 16–14, scoring in the last minute of their semi-final. Cameron Smith was suspended for two matches for a grapple tackle on Brisbane's Sam Thaiday in the match, seeing him miss the rest of the finals, and Craig Bellamy was fined $50,000 for making scathing remarks against the judiciary's decision. Melbourne convincingly beat the Cronulla Sharks 28–0 to qualify for the Grand Final, but suffered the heaviest Grand Final defeat in league history, beaten 40–0 by Manly. Greg Inglis, Billy Slater, Cameron Smith and Israel Folau all won awards at the Dally M Awards, and Slater and Smith finished equal second for the Dally M Medal. Billy Slater was awarded the international player of the year Golden Boot award for 2008, following on from Cameron Smith in 2007. In the 2009 season, Melbourne finished 4th on the ladder; they defeated Manly 40–12 in the first week of the finals and Brisbane 40–10 in the preliminary finals to qualify for a fourth straight grand final (the first since Parramatta from 1981–1984). Against Parramatta, who had finished eighth in the home-and-away season but had won ten of its last eleven matches, the Storm led at one stage by 16 points, before finishing 23–16 winners. Slater won the Clive Churchill Medal, and they were named as the NRL Team of the Decade for the 2000s. In the late 2000s the Melbourne Storm were still running at a loss of up to $6M per season, however, they were voted the state of Victoria's most popular sports team by a national Roy Morgan Poll in October 2009. On 11 January 2010, it was announced that Brian Waldron resigned his position as CEO to take up the same position at the Melbourne Rebels Super Rugby team. he was replaced by Matt Hanson who, at the time, was the Chief Operating Officer, however, following the Salary cap revelations Matt Hanson was then stood down and Ron Gauci appointed. The Storm's first match of the season was the 2010 World Club Challenge against equally dominant English side, the Leeds Rhinos; in very cold and wet conditions the Storm prevailed 18 – 10. 2010 also saw the Storm unveiling their new home ground AAMI Park. On 22 April 2010 the club admitted that it had committed serious and systematic breaches of the salary cap for the last five years by running a well-organised dual contract and bookkeeping system which left the NRL ignorant of $3.17 million in payments made to players outside of the salary cap, including $550,000 in 2007, $965,000 in 2009 and $1.03 million in 2010. As a result of the Melbourne Storm salary cap breach, NRL Chief Executive David Gallop stripped the Melbourne Storm of their 2007 and 2009 Premierships and their 2006, 2007 and 2008 minor Premierships (all of which were withheld, rather than awarded to the runners-up), fined them a then Australian sporting record $1,689,000, deducted all eight Premiership points they had already received in the 2010 season, and barred them from receiving Premiership points for the rest of the season. The club had won enough matches to make the finals, but automatically finished in last place due to the penalties. The penalty did not have an effect on the players, who remained eligible for Test and State of Origin selection as well as Dally M contention; ultimately, Melbourne did not figure prominently in the latter awards. The Storm's 2011 season saw a return to the top of the NRL ladder, winning what after the salary cap penalties was considered the club's first Minor Premiership. The season included a club record twelve consecutive wins. However, Melbourne did not reach the Grand Final, losing the preliminary final against New Zealand. Billy Slater won the Dally M Medal, and Craig Bellamy and Cameron Smith also won awards on Dally M Medal night. The Storm's 2012 season started very strongly with nine consecutive wins, the club's best start to a season up to that time. A five-game losing streak between Rounds 16 and 21 (the club's second worst losing streak to that time) saw them fall from the top of the ladder. However, from Round 22 forward they recovered their winning form and finished the regular season with five straight wins, ending the regular season in second place on the table. Storm began their finals campaign with a 24–6 win over South Sydney Rabbitohs. Storm played its fifth Preliminary Final in six years, this time defeating Manly-Warringah Sea Eagles 40–12 at AAMI Park. Following this they went on to claim their second official Premiership defeating the Canterbury Bulldogs 14 – 4 in the Grand Final. The Storm began its 2013 season when they defeated Leeds Rhinos 18–14 in the World Club Challenge, to be crowned World Champions for 2013. In round 5, they won their 5th consecutive game for the season and their 13th consecutive overall. Setting a new club record, the streak ended at 15 games with a loss in Round 8. On 21 May 2013 the Storm announced that, News Limited had sold the club to Holding M.S. Australia Pty Limited, an organisation made up of internationally experienced and successful businessmen. This change included replacement of the News Ltd Board and Executive, which included the replacement of Chairman Stephen Rue with Bart Campbell and CEO Ron Gauci with Mark Evans. News Limited had owned the Storm since its inception in 1997. On 9 June 2013 Captain Cameron Smith played his 250th game for the club. The Storm managed to finish 3rd in 2013; however, successive losses to the South Sydney Rabbitohs and Newcastle Knights in the finals saw the Storm miss the Preliminary Finals for the first time since 2005 (excluding 2010). The 2014 saw a number of milestones achieved, both Billy Slater and Cooper Cronk played theair 250th games and Craig Bellamy reached 300 games as coach. In mid 2014 the Storm also announced a new feeder partnership with the Sunshine Coast Falcons this would complement their existing relationship with Brisbane Easts with a view to establishing a permanent footprint in the Sunshine Coast Area. 2015 began successfully for the Storm with the club finding itself on top of the ladder by Round 7. In April Storm CEO Mark Evans announced that he was returning to England and completed his tenure as CEO in June of that year. Dave Donaghy was announced as his replacement. In round 19 a major milestone was achieved with Cameron smith playing his 300th game becoming only the 24th player in history to do so. In August 2015 the storm announced that they would create an Academy on the Sunshine Coast to develop and nurture developing talent in the region with a view to progressing through the Storm ranks. Part of the establishment of this Academy meant that the Melbourne Storm Under 20s Team would play all of its home games at the new facility from 2016 onward. The 2016 season began well for the Storm finding themselves in third place on the ladder after 10 rounds. In Round 5 they scored their 300th NRL win and in Round 9, Craig Bellamy coached his 350th NRL game. On 23 May the Melbourne Storm announced that it had been one of three successful bidders and the only NRL club to gain a licence to field a Netball side in a new expanded Australian Netball League to commence in 2017. The Storm were nominated by Netball Australia as a preferred bidder for one of three new team licences under their expansion plans. "Melbourne Storm have partnered with the University of the Sunshine Coast for this project and we're both very proud and excited to have reached the preferred bidder stage for a licence in the new National Netball League," Smith said at the announcement press conference on Thursday. On 17 August 2016 it was announced that the new team will be called Sunshine Coast Lightning and be based on the Sunshine Coast at the Storm sports Academy and in effect be a second Queensland Team. The announcement is to establish the Storm as not just a Rugby League club but a sporting and community club. At the conclusion of the 2016 NRL season the Melbourne Storm finished in first place claiming their second legitimate Minor Premiership. They qualified for the NRL Finals series winning their first two finals and thus making it through to the 2016 NRL Grand Final against the Cronulla Sharks. The game was a very hard-fought match, as the game hung in the balance until the dying second but the Sharks hung on to win. 2017 was another successful year for the Melbourne Storm, the club's 20th season in the NRL. Following on from the heartbreak of losing the Grand final in 2016, the club went from strength to strength recruiting well in the off season and dominated the 2017 NRL season to finish in first place earning them their third legitimate minor premiership. The Storm won 20 and lost 4 games throughout the season making it their most dominant season in 10 years. Cameron Smith also broke a number of league, club and personal records throughout the 2017 season including the NRL games record for the most games played, league record for the most wins as a captain, a personal best for the most points in a game and also scored his 2000th career point and 1000th career goal, the first time any player has achieved this. The Storm continued their success into the 2017 NRL finals and won their first two, a home Qualifying final against the Parramatta Eels 18–16 and a home Preliminary Final against Brisbane Broncos 30–0 to qualify them for their second consecutive Grand Final. The 2017 NRL Grand Final was played against the North Queensland Cowboys, which Melbourne Storm dominated to earn them their 3rd official Premiership 34 – 6. Billy Slater won his second Clive Churchill medal. In December 2017, the NRL announced the formation of a women's competition with Melbourne Storm expressing their interest in applying for a licence to participate in the inaugural NRL Women's season. 2018 began in successful fashion for the club when on Friday 16 February the Storm beat the Leeds Rhinos to win the 2018 World Club Challenge 38–4. In 2018 the club is also celebrating its 20th anniversary and on 2 March announced their team of the first 20 years during a gala evening at Crown Casino. The 17-man line-up is made up of the greatest players to have pulled on the purple jersey over the last two decades. Originally, the club favoured the name Melbourne Mavericks with a gunslinger logo holding a fistful of dollars. The club officials were all set to go with this until News Limited's Lachlan Murdoch told them to go with something else because the Mavericks sounded too American. Trams and Flying Foxes were also some ideas that came up. However, co-CEOs Chris Johns and John Ribot decided to go with the themes of lightning, power and storm. The club then became known as the Melbourne Storm. The Storm was always going to go with the colours of their state, Victoria (navy blue with a white 'V'), but club consultant at the time, Peter McWhirter of the JAG fashion house, suggested that they should also have purple and gold to make their merchandise more attractive. These colours appear in the logo; however, on the home jersey they have varied. Between 1998 and 2004 these four colours also appeared but between 2005 and 2009, gold was completely removed and silver introduced. Between 2010–2012, gold returned, silver was omitted and purple became the dominant colour in the jersey. For 2013 a new design was announced featuring a deeper V, with more navy blue in the jersey. Gold disappeared along with most of the white, and the lightning bolts were changed to purple. During 2015 the jersey changed again, for the first time not featuring a V at all, but the V returned somewhat along with the lightning bolts in 2016 with a manufacturer change. Over the years and in all variations of the jersey, navy blue and purple always remain the main colours. Between 1998–2001, Melbourne was the only club to display player names on the back of jerseys. This was because there was no major sponsor for the Storm to display on the chest or back at the time. It also helped supporters new to the game identify the players. In 2001, Melbourne gained its first major sponsor in Adecco, which was displayed on the jersey chest, while maintaining the players' names on the back until the end of 2001. In 2002, the Storm removed the players' names and displayed Adecco's logo on the back. Since then the Storm have had varying sponsors adorning the jersey. In October 2017, the club began celebrations of its 20th Anniversary, with the announcement that a new logo would feature for the duration of the 20 year celebrations. 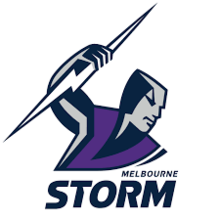 The logo was a shield based logo with the storm man featured above the words "Melbourne Storm 20 Years". On 17 October 2018, the club replaced the 20th Anniversary logo with a new permanent logo. The new permanent Logo is a derivation of the 20 year logo featuring no shield and a more bold "Melbourne Storm" and has also dropped the colour Yellow from the logo however it still exists on the collar of the uniform. The Melbourne Storm's club song, written by Jon Mol and Phil Wall, is called "We Are the Storm". The song played over the public address system following each home victory. When the team enter the stadium, the AC/DC song "Thunderstruck" is played. The Dragons – Storm rivalry was at its highest in the years following the 1999 NRL Grand Final. In this game the Storm narrowly beat the Dragons, with a late penalty try putting the Storm in front. The following year, Anthony Mundine declared that the Storm were not "worthy premiers" in the run up to their round 5 rematch. The Storm responded by belting the Dragons 70–10. However, later that season, the Dragons had a large win defeating the Storm 50–4. In 2006, the Storm and Dragons once again met in a Preliminary Final which the Storm won. On 21 July 2008, the Storm won at Olympic Park 26–0, in a match highlighted by several ugly brawls. In 2009, the Storm defeated the Dragons in Round 1 17–16 with a field goal in Golden Point extra time. Since then the rivalry has subsided somewhat and is no longer as strong as it once was. The Melbourne Storm has a strong rivalry with Brisbane, built in large part on the large number of finals games played between the teams, including one final in each year from 2004 to 2009, with the Storm winning all but one of them. The move of Brisbane assistant coach Craig Bellamy to Melbourne has also been attributed to fueling the rivalry, as well as the wide spread of Queensland Origin players across their squads in the better part of the past decade. When Bellamy left here and went to Melbourne, the rivalry with them went up a notch then... their record is good against us. Every year since Brisbane's victory over Melbourne in the 2006 Grand Final, Melbourne have ended the Broncos' season by knocking them out of the finals. Melbourne captain Cameron Smith commented on the rivalry prior to their 2009 Preliminary Final at Etihad Stadium. A lot of people talk about us and Manly, but I think all the boys for whatever reason would say we take more satisfaction out of beating the Broncos...we love playing them...there is always plenty of feeling and intensity in the games...it probably wouldn't feel like September if we weren't playing them at some stage. The Brisbane Broncos defeated the Storm 15–8 in the 2006 NRL Grand Final. The Storm sought revenge through a 40–0 thrashing in the 2007 Qualifying Final at Olympic Park Stadium. The 2008 Semi-Final at Suncorp Stadium ended with Melbourne dramatically winning 16–14 with a try on the final play of the game. In 2009 Brisbane were again beaten by eventual premiers Melbourne, this time 40–10 at Etihad Stadium, catapulting the Storm to their 4th consecutive Grand Final Appearance. The Storm defeated Manly 34–8 in the 2007 Grand Final but lost to[clarification needed] in the 2008 re-match in a 0–40 loss. To add to the rivalry, Melbourne beat Manly 40–12 in the opening final of the 2009 finals series, ending their bid to be back-to-back premiers. In September 21, 2012, Storm and Manly played each other in the preliminary final for the first time. Storm again thrashed Manly 40–12, again ending their chances of winning back-to-back titles. —  Brett Finch, 8 September 2009. In 2011 another major chapter was written in the rivalry of the two clubs in what became known as the "Battle of Brookvale". This game involved a massive brawl that in the end involved interchange players and officials from both clubs as well. Players were red carded and the brawl escalated in the players tunnel as well  What made this worse was that the match was attended by then CEO of the NRL David Gallop. This is more of a traditional rivalry due to the large amount of Kiwi internationals Melbourne has fielded in their history. Matches between the two clubs are normally close and low scoring, with the overall head to head (as of 2017) in Melbourne's favour (40 clashes, Storm 22-Warriors 16 and 2 draws). These two sides played an annual ANZAC Day clash each year between 2009–2014. For 2015 it was played earlier in April before moving back to ANZAC Day for 2016 onwards. Both teams play for the Michael Moore Trophy. Melbourne's current home ground is AAMI Park and has been since the 2010 season. Prior to this the club played the vast majority of their home matches at the city's now demolished Olympic Park Stadium, which was located next door. Affectionately coined "The Graveyard" by fans due to the incredible 77.2% winning percentage there, it was there that the club played their inaugural home match in the fourth round of the 1998 season on 3 April 1998, having come off the back of three successive away victories. The team recorded a 26–16 victory over the North Sydney Bears, and the crowd of 20,522 was the largest attendance for the club at Olympic Park. It was also at this time that Melbourne Storm helped set a Rugby League World record attendance figure of 107,999. This was during the 1999 NRL Grand final, held at Stadium Australia where they defeated the St George Illawarra Dragons, to win their first NRL premiership. As the ground's capacity has since been reduced this record cannot be broken. The team remained at Olympic Park until the end of the 2000 season, when it was decided that due to attracting larger home crowds which were now averaging 14,622 spectators, they decided to relocate to the much larger capacity Docklands Stadium for the following season. However, due to Docklands stadium being primarily suited to AFL games and in addition the AFL and stadium management being reluctant to reconfigure the seating for Rugby League games and coupled with the team missing the finals that year, crowd numbers declined and it was decided to move the team back to Olympic Park. Docklands stadium was still used by the Storm for home finals until 2010 and this allowed a home final attendance record of 33,427 to be set in 2007 in the Preliminary Final against Parramatta. From 2002, crowd numbers declined and by 2004 the Storm had their lowest crowd average of 8,886 per home game; however, at this time the Storm also began a strong recruiting drive and with a new and exciting playing roster, crowds steadily rose over the following years, returning to an average of 14,670 by 2010. The Storm played their final game at Olympic Park in round 25 of the 2009 season, 29 August 2009, with a 36–4 thrashing of the Sydney Roosters The intention was to relocate to its new home venue next door at AAMI Park; however, delays in construction meant that the first game could not be played at the venue until Round 9 of the 2010 season, therefore, the first three home games of 2010 were played at Etihad Stadium. Since then all Storm home games (with the exception of a few homes games played interstate), regular season and finals, have been played at AAMI Park. Following winning the 2012 premiership and having sustained onfield success, crowd numbers continued to rise. The club's highest regular season attendance at AAMI Park, of 28,716, was set on 25 April 2014 for the ANZAC Day match against New Zealand Warriors. The average crowds have continued to increase and by the end of the 2016 season had reached a peak of 18,079. The 2016 season also included their highest official "home" attendance of 52,347 set during a doubleheader game at Suncorp Stadium in Brisbane (although it was designated as a "home" game, it was not played at Storm's home ground). As of Round 5 in the 2019 NRL season, the Storm have won three legitimate NRL Premierships (1999, 2012, 2017) and three Minor Premierships (2011, 2016, 2017). Their current wins percentage of 65.52% is the best in the league. The most capped player is Cameron Smith with 389 NRL appearances thus far, this is currently a league record as well. In addition, Smith is also the leagues highest point scorer with 2422 career points. Fullback Billy Slater is the club's most prolific try scorer with 190 tries scored during his career. Melbourne Storm players have also won the Dally M medal on five occasions: Cameron Smith twice in 2006 and most recently in 2017, Billy Slater in 2011 and Cooper Cronk twice in 2013 and 2016. The Storm have thus far had five Golden Boot award winners, more than any other club (Smith 2007 and 2017, Slater 2008, Greg Inglis 2009 and Cronk in 2016). Melbourne Storm's current winning streak record for the most consecutive matches won stands at 15 matches, completed between Round 22 of the 2012 NRL season and Round 7 of the 2013 NRL season; this included winning the 2012 NRL Premiership. The club's all-time highest score is 70 points scored against St. George Illawarra on 3 March 2000 but the highest winning margin is 64 points achieved in a 64–0 win over West Tigers in 2001 and equaled in a 68–4 win over Canberra Raiders in 2013. As part of their 10-year celebrations in 2007, Melbourne Storm released a team of the decade. The 17 man team was selected by former assistant coach Greg Brentnall, foundation CEO John Ribot, and then board member Frank Stanton (all 3 were members of the 1982 Kangaroo tour "Invincibles", Brentnall and Ribot as players with Stanton the coach). The trio were joined by The Daily Telegraph (Sydney) journalist Steve Mascord. As part of their 20-year celebrations in 2018, Melbourne Storm announced their team of the first 20 years at a gala night at Crown Casino on 2 March 2018. The 17-man line-up is made up of the greatest players to have pulled on the purple jersey over the last two decades. The team selection panel included Storm football director Frank Ponissi, chief executive Dave Donaghy, inaugural chief executive John Ribot, former assistant coach Greg Brentnall, journalist Roy Masters and current coach Craig Bellamy. The Melbourne Storm's supporter base grew from almost 500,000 in 2004 to almost 800,000 in 2009, making them the fourth most popular rugby team. The club's supporter group, the "Graveyard Crew", make a banner for the team to run through before the start of each game. Billy Brownless – Former AFL player and TV/Radio personality. Jim Courier — Retired American tennis player, Four time Tennis Grand Slam champion. In 1998, the Storm established an affiliation with Queensland Cup side the Norths Devils and used the club as a feeder for their first grade team. The relationship would prove to be a fruitful one as 13 of the 17 players to compete for the Storm in the 2006 NRL Grand Final had played for the Devils in previous years. In 2005, the Storm also established an affiliation with the North Sydney Bears in the New South Wales Cup. Melbourne severed ties with both the Bears and the Devils in 2007 and aligned themselves with the Central Coast Storm in the New South Wales Cup. The affiliation lasted three seasons before the Storm decided to establish their own team in the NSW Cup in 2010 which would share its namesake. An unsuccessful venture saw the Storm revert to the Queensland Cup in 2011 when it established a feeder relationship with the Easts Tigers. Melbourne established a second feeder relationship with the Sunshine Coast Falcons in 2014, also from the Queensland Cup. The Storm further committed to the area in 2015 when it was announced their National Youth Competition U20 side would be based out of the Sunshine Coast from 2016. ^ NRL. "Lightning joins Storm family". NRL CLUBS. Retrieved 18 August 2016. ^ Roy Masters (20 November 1994). "Plan for super league gone awry". The Sunday Age. Australia: Fairfax. p. 19. Retrieved 4 May 2010. ^ a b c Collis, Ian & Whitaker, Alan (2004). The History of Rugby League Clubs. Sydney: New Holland Publishers (Australia) Pty Ltd. p. 344. ISBN 1-74110-075-5. ^ Collis, Ian & Whitaker, Alan (2004). The History of Rugby League Clubs. Sydney: New Holland Publishers (Australia) Pty Ltd. p. 345. ISBN 1-74110-075-5. ^ Cockerill, Ian (3 October 1999). "Eye of the Storm". The Sunday Age. South Africa. p. 4. Retrieved 6 October 2009. ^ a b Collis, Ian & Whitaker, Alan (2004). The History of Rugby League Clubs. Sydney: New Holland Publishers (Australia) Pty Ltd. p. 346. ISBN 1-74110-075-5. ^ Collis, Ian & Whitaker, Alan. The History of Rugby League Clubs. Sydney: New Holland Publishers (Australia) Pty Ltd. p. 347. ISBN 1-74110-075-5. ^ Masters, Roy (17 September 1999). "Ribot de Bressac has the last laugh over Storm in China". The Sydney Morning Herald. p. 40. Retrieved 6 October 2009. ^ Collis, Ian & Whitaker, Alan (2004). The History of Rugby League Clubs. Sydney: New Holland Publishers (Australia) Pty Ltd. p. 349. ISBN 1-74110-075-5. ^ Collis, Ian & Whitaker, Alan (2004). The History of Rugby League Clubs. Sydney: New Holland Publishers (Australia) Pty Ltd. p. 350. ISBN 1-74110-075-5. ^ Gould, Phil (21 December 2003). "NRL expansion talk excites Gold Coast". The Sun-Herald. The Sydney Morning Herald. Retrieved 6 October 2009. ^ "Danny Williams suspension". The Sydney Morning Herald. 5 August 2004. ^ "Craig Bellamy". Platinum Speakers Entertainers. 30 April 2013. ^ "Rugby League Tables / Season 2006". Archived from the original on 21 April 2006. Retrieved 28 July 2007. ^ "Broncos edge Storm for NRL title". BBC News. 1 October 2006. Retrieved 28 July 2007. ^ "Cooper Cronk notches up 250 games with Melbourne Storm". TVNZ. 31 August 2014. Archived from the original on 23 September 2014. Retrieved 31 August 2014. ^ "Matt Orford wins Dally M". Fax Sports. 30 April 2013. ^ "Melbourne Storm wins NRL grand final". The Australian. 4 October 2009. Retrieved 4 October 2009. ^ "Storm Team of the Decade". Daily Liberal. 4 October 2009. ^ Stathi, Paxinos (22 October 2009). "Biggest fan base? Not the Magpies, says poll". The Age. Retrieved 25 September 2011. ^ "Melbourne Storm CEO Brian Waldron quits to join Melbourne Rebels". Herald Sun. 11 January 2010. ^ "Storm World Champions". Herald Sun. 28 February 2010. ^ "Storm become World Champions". Melbourne Storm. 23 February 2013. Archived from the original on 5 April 2013. ^ "Storm Media Release". Melbourne Storm. 21 May 2013. ^ a b "Cooper Cronk notches up 250 games with Melbourne Storm". Big News Network.com. 31 August 2014. Retrieved 31 August 2014. ^ NRL. "Storm joins forces with Sunshine Coast Falcons". NRL CLUBS. Retrieved 23 May 2016. ^ "Storm CEO Mark Evans to return to the UK". Melbourne Storm. April 2015. ^ "Storm name Dave Donaghy to Chief Exectutive". The Age. June 2015. ^ "Storm announce academy on Sunshine Coast". ABC News. 28 August 2015. Retrieved 23 May 2016. ^ NRL. "We're very excited". NRL CLUBS. Retrieved 23 May 2016. ^ Cavanagh, Chris (6 December 2017). "Melbourne Storm pushing for team in new women's competition". Herald Sun. Retrieved 7 December 2017. ^ a b "Storm announce 20 Year Team". nrl.com.au. Retrieved 2 March 2018. ^ "Melbourne Storm". Convict Creations. 1 May 2013. ^ "Addecco joins Storm in 4 million dollar deal". rleague.com. 1 May 2000. ^ "Storm launch 20 year celebrations". Melbournestorm.com.au. Retrieved 31 October 2017. ^ "New look Storm". Melbournestorm.com.au. Retrieved 17 October 2018. ^ "We are the Storm". Melbourne Storm. 1 May 2013. ^ "Haunted Dragons facing Storm graveyard". Illawarra Mercury. 17 July 2008. ^ a b "Enemy No.1 in Melbourne Storm sights". Herald Sun. 26 September 2009. ^ "Melbourne Storm thrash Manly Sea Eagles in 2012 NRL preliminary final". Herald Sun. 22 September 2012. ^ "Rivalry stokes Cameron Smith". Herald Sun. 8 September 2009. ^ Jackson, Glenn (27 August 2011). "Battle of Brookie set to take toll on big guns' title assault". Sydney Morning Herald. Retrieved 11 November 2011. ^ "Rivalry round Clashes". NRL.com. 7 July 2009. ^ a b c d "Rugby League Tables / Attendances Melbourne". Retrieved 12 May 2017. ^ "Countdown to final Olympic Park game". Rleague.com. 25 August 2009. ^ "Welcome to AAMI Park". collie. 28 June 2010. ^ "Melbourne Storm Statistics and Records". rleague.com. March 2015. ^ "Melbourne Storm Captains and Coaches". Melbourne Storm. 4 June 2013. ^ "Melbourne Storm Team of the Decade". Archived from the original on 22 August 2008. Retrieved 21 July 2007. ^ "Melbourne Storm names greatest ever team for 20th anniversary". heraldsun.com.au. Retrieved 6 March 2018. ^ Heming, Wayne (30 October 2009). "Brisbane Broncos voted Australia's most popular football team". foxsports.com.au. AAP. Retrieved 31 October 2009. ^ Healey, Kelvin (1 October 2006). "Calm start for Storm". Sunday Herald Sun. News Limited. Retrieved 17 December 2009. ^ a b "Molly Meldrum devastated by NRL Penalty". Herald Sun. 22 April 2010. ^ "Celebrity Spotlight: Nicole Livingstone". Getaheadkids.com.au. 7 November 2016. ^ "Jana Pittman cheers on the Storm". Getyimages.com.au. 7 November 2016. ^ "Lydia Lasila". suzuki.com.au. 7 November 2016. ^ "Sarah DeBono on Twitter". twitter.com/sarahdebono. 7 November 2016. ^ Ison, Chris (12 July 2012). "Gillard supports CQ NRL bid". Gladstone Observer. Retrieved 15 April 2014. ^ "Grand final 2017: Waleed Aly takes pride in roles as Storm recruiter and former Richmond mascot". 6 March 2018. ^ "Jamie Whincup on Twitter". twitter.com/jamiewhincup. 7 November 2016. ^ "jbairstow21 on Twitter". 15 January 2017. ^ "Melbourne Storm coach Craig Bellamy pays tribute to Tom Hafey". 13 May 2014.